Do People Help or Hurt Your Scenic Photos? I've had photographers tell me that they would patiently wait -- sometimes for an hour -- for people to clear out of a scene so they could photograph it. This becomes a bigger challenge once school lets out and family vacation season begins. Do people really ruin this scenic shot? Personally, I don't think so. Click on image for larger version. Photos by Derrick Story. Sometimes people add visual interest to a composition. Plus they can help with sense of scale. Yet it's true, there are those situations where they are an annoying distractions no matter how you compose the scene. 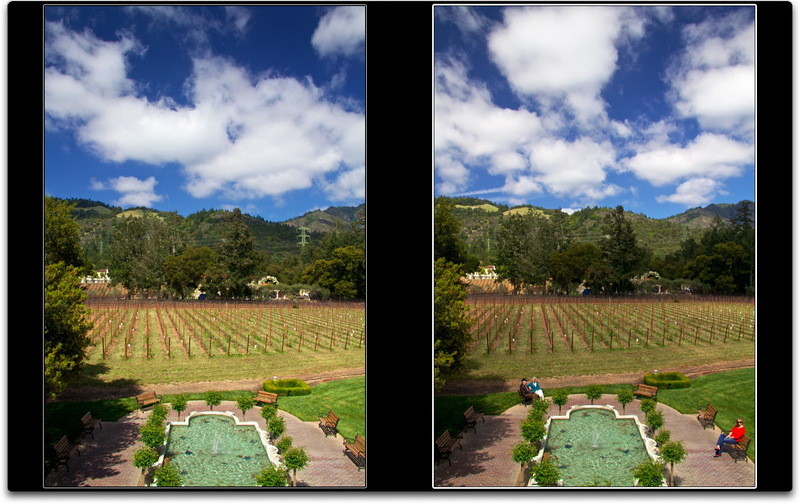 So the answer for me is to try to capture the photo both ways, then decide later which version I like best. And if it's not possible to eliminate those pesky humans, then I wait for a decisive moment where they're doing something interesting. As for the photo above, which way to you vote? People... or not? I vote not, at least for these two. It's not so much the people, it's the spot of bright red that causes a problem for me in #2. My eye jumps the the red, and once there I lose interest. The advantage of people in the shot (in this case) is to give scale to the foreground. It might be okay if the red (and maybe the blue) were desaturated. I don't think the people, in this shot, add to the story. I completely agree with Doug. I think that people can work for a particular photo, although in this case the red shirt is distracting. The original point of the article is a good one, though. We shouldn't be put off by people in a photo. On the other hand, if you want to "remove" the people from the photo, you can always use an ND filter and a long shutter speed. ...or shoot several shots within a certain time interval and use the magic of photoshop to clone away ppl. The power lines bother me the most. I am also distracted by the red sweater, but overall it is the way the power lines that stand out in the first photograph that I find most annoying. It looks like I'm odd man out but I do favor the shot with the people in it; even though I too have waited or come back when people are not around. Now if this were a picture od a pristine mountain stream it would be a different story........unless the person was fly fishing.